The Indian Railways has just launched RailRadar, a useful website that shows the current geographical location of any train on a Google Map. To get started, you can zoom-in to any location /city on the map to see all the trains which are arriving at the station or have just departed. 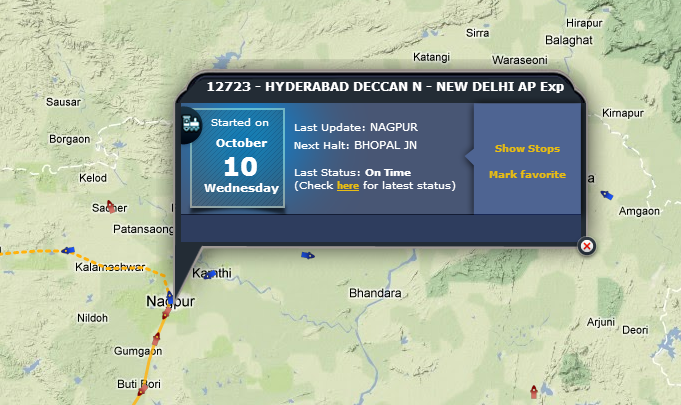 Or you can use expand the left sidebar to search trains by name, by train number or by the station name. If you click a particular train, the map will also show the exact route of the train including all the stops and the current location of the train. The train markers highlighted in blue indicate trains that are running on time while the red markers indicate trains that are delayed or behind schedule. The press release says that the train data is refresh every 5 minutes and the displayed location and running status of any trains displayed on the Google will always be delayed by at least 5 minutes. The site is extremely useful and it will work on your mobile phone as well. Copyright 2012-13.Created by Nitin Singh. Powered by Blogger.